How can it be possible that the course of events of World War II was significantly altered by a small group of museum directors, curators and art historians? George Clooney, adding another directorial credit alongside “Good Night, and Good Luck” and “The Ides of March,” teams up with his actor pals — Matt Damon, Bill Murray and John Goodman, among others — to tell the story of one of the greatest treasure hunts in history, where the prizes are not gold but Rembrandts and Rubenses. Based on a book by Robert M. Edsel, as well as the actual Monuments, Fine Arts and Archives unit commissioned by the U.S. government, “The Monuments Men” is a race-against-time film about the little known art preservation efforts conducted in Europe during World War II. Confronting the final chapter of Hitler’s Reich, Clooney plays the dignified George L. Stout, a role based on the real-life museum director and art connoisseur tasked with a seemingly impossible mission: to infiltrate enemy lines in order to save countless pieces of hidden art stolen by Nazi thieves before they are destroyed by Hitler. The central question of the movie becomes evident early on: Is this unlikely group of characters willing to risk their lives and the lives of their fellow comrades in order to save some Michelangelos and Picassos? With the amount of people dying during wartime, who cares about art? Is saving art worth the sacrifice of human life? Skeptics might be tempted to overlook the movie, quickly dismissing it as just another World War II movie to add to the pile along with Tarantino’s somewhat recent out-of-control Nazi killing spree, “Inglourious Basterds.” On the contrary, “The Monuments Men” is heartfelt. (Well, as heartfelt as a movie that takes place in Nazi Germany can be.) The story is adorned with funny dialogue — John Goodman’s physical comedy provides many laughs, as do Matt Damon’s attempts to speak French — and, in the end, ends up being memorable not only because of the suspenseful storyline but also the camaraderie within the group. 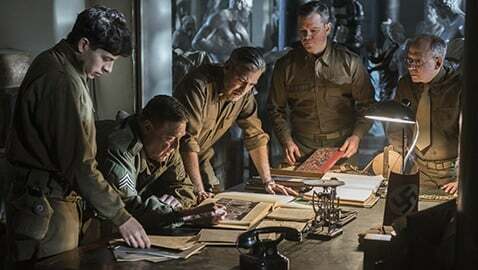 Just when we thought Hollywood had wrung the World War II movie genre dry, “The Monuments Men” provides a refreshing point of view, shedding light on the value of cultural artifacts — something with the unexpected ability to connect us during a time when the world seemed more disconnected than ever before.